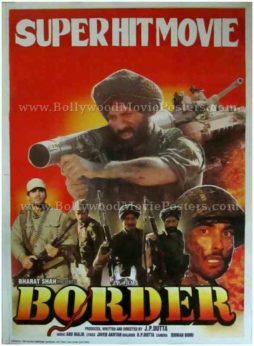 This is an actual surviving classic poster of the 1997 film by JP Dutta that went on to become one of the finest patriotic films ever made in Indian cinema. 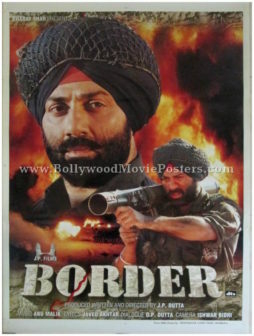 This poster features key characters from the war movie, the most prominent of them being Sunny Deol, depicted on the center of the poster. The typography used in this poster is entirely in English. 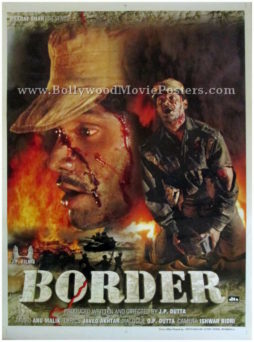 Border is a 1997 blockbuster Hindi film based on the Indo-Pak war of 1971, called the “Battle of Longewala”. 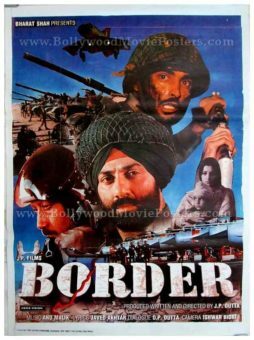 This multi-starrer war movie is considered as one of the finest patriotic films ever made in Indian cinema. The film bagged numerous awards and its music is played till today.